A line formed outside the Rathskeller bar Saturday in State College. Photo by Daniel Myers. Lauren Muthler grew up in the State College area, has lived her whole life here. She never has participated in State Patty's Day, though. Now a Penn State junior in political science and journalism, Muthler has seen the effects of the annual drinking holiday, held for the fifth time on Saturday. She has a relative who once struggled to get timely emergency medical care because State Patty's drunks clogged the Mount Nittany Medical Center ER. Her relative's medical condition is involuntary. The same can't be said for the State Patty's drunks. But rather than try to stop State Patty's Day entirely, Muthler joined hundreds of other State College-area locals this weekend in an inaugural town-gown outreach effort. "We're not here to fight," Muthler explained soon before midnight Saturday. She doesn't hate anyone who participates in State Patty's Day, and she understands that it's going to happen, she said. "We're just here to help out," Muthler went on. Having more locals in the downtown on the occasion, she said, shows that "we're just going on with our own daily lives" and not giving "our entire downtown to this (drinking) event." The community-outreach concept wasn't meant to put unpaid police-state monitors on the streets, organizers said. Rather, it was rooted in the "Bless the Fest" idea that local churches tried about a decade ago, when church-going volunteers took nighttime strolls and gave out free food downtown during the Central Pennsylvania Festival of the Arts. At that point, they wanted to bring a calming, community-driven presence in the wake of highly publicized downtown "riots." And so it was again this weekend with the community initiative, led largely from the borough building. 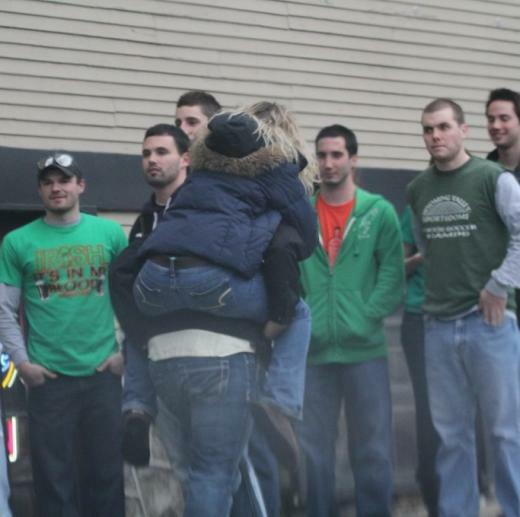 Community leaders including police Chief Tom King; the Penn State Interfraternity Council, Panhellenic Council and other Greek-life organizers; the Off-Campus Student Union; and borough neighborhood associations aligned in the daylong effort, putting two-person volunteer teams on the streets for two-hour shifts. Some 300 people signed up in advance, but more than 200 others -- apparently spontaneously -- showed up to help out on Saturday and early Sunday. Not everyone formally logged in. But those who did included 252 non-student residents and 238 Penn State students, said Kate Doe, an Americorps worker who coordinates neighborhood outreach for the borough. Among the groups most well represented in the turnout were the Off-Campus Student Union, Penn State graduate students, Theta Chi, Kappa Delta Rho, Alpha Chi Rho, City Church, the Penn State football team, the IFC and the Panhellenic Council, Doe said. "My hope for next year is that there will be even more community-driven involvement," said Courtney Hayden, another Americorps worker in the borough. She said permanent residents were genuinely excited to team with students in the effort -- and to share their longer-term perspectives and observations about the town. At this stage, it's hard to quantify exactly how much tangible impact the volunteers had over the weekend. They clearly acted as extra sets of sober eyes and ears downtown, often giving befuddled drunks directions to their respective destinations. Some volunteers called in reported misbehavior, such as the tossing of ice from an East Beaver Avenue apartment building. Organizers saw the overall initiative not as an end, but as a beginning step in what they hope will become a multi-year program. As borough Manager Tom Fountaine put it, the push opened up "a lot of good conversations among students and other volunteers about the event and other things ... to improve the town." Said Doe: "Everybody's thought (is that) this is a really good step forward." Backing came from across the community. At the intersection of College Avenue and South Allen Street, the Off-Campus Student Union handed out free pretzels provided by the Philly Pretzel Factory. The Deli restaurant provided 150 free meals to the community volunteers who helped out. The Gingerbread Man pitched in with 20 donated pizzas. Elsewhere across town, responses to State Patty's Day were arguably more visible than ever. Not only did eight downtown establishments halt all alcohol service Saturday, but at least two others closed early. Nittany Beverage, off West College Avenue, closed for the day, too. Meanwhile, dozens of Penn State students participated Saturday in new "State Service Day" volunteer activities, put on by university student groups. An alcohol-free Street Love Tour supported by some campus religious groups saw similarly strong turnout. Inevitably, headlines this week will point to the volume of misbehavior that State Patty's Day brought to State College. But the story this year is bigger than that. More and more, Penn Staters and State College locals are openly disavowing the event, once called a "drink until your brains fall out" festival by the late borough Mayor Bill Welch. More and more, people are not only speaking out but also acting out -- with grace -- to undermine it. This is the community we know. And this is why we live here.